? ? ?The great American editor and publisher Sol Stein was once asked what he looked for when he began reading a new manuscript. He responded, I want to fall in love. The editor of such greats as Elia Kazan, James Baldwin, Dylan Thomas and Jack Higgins, Stein knew a thing or two about what would make a novel successful. He went on to say that if he did not love a character, a situation, or a premise within the fist few pages of a manuscript he would pass it on to someone else to consider. This is a wise thing for writers to remember.? ? ?Today more than ever most readers lead busy lives and for many of them finding time to sink into a work of fiction is a luxury. Now, in the infancy of electronic self-publishing, competition for readers is intense. Creating an opening to our work that will engage the reader’s interest and tantalize the imagination takes not only a devotion to craft but a willingness to engage with one’s readers as never before. As a writer I believe that it is my responsibility to 1.) create an intriguing character, 2.) give that character a purpose that readers can resonate with, and 3.) invite my readers into a world they can be intrigued by, where they can spend time with a character or characters they care about. It has been said that all great books are about the same thing desire. The desire to get the girl, find out whodunnit, kill that white whale, find justice or love or purpose, win the war, or vanquish Voldemort. It doesn’t always matter what the desire is but if the character who desires it is not suffused with yearning in a manner the reader can understand and relate to, they are probably not going to stick around for 100k words. The sooner the author can seduce the reader into caring about a character and a character’s quest, the more likely the reader is to keep reading. ? ? ?“I saw her. At first it was the penumbra of red light surrounding the wine dark hair. My world had few beauties in it. Yes, there were the sunrises and sunsets, the moonlight trails across tropical waves, the sparkle of stars in Arctic seas. And women, too. Women had craved me but how can any man unravel the complexities of womens cravings? I have laid them down and enjoyed it. These words are spoken by a character who doesn’t show up until halfway through the book but, I hoped, it would provide enough intrigue to keep readers reading. Every Thursday night the Wild Bunch met at The Arm Pit for the special and beers. Back in high school they had called themselves the Wild Bunch, now, thirty-some years later, Charlie Pikawski said they ought to be the Mild Bunch. The bunch had diminished, too. These days they were lucky to get six of them together. When Pete Black had time to drive from Boston hed show up but Father Pete had just celebrated his silver anniversary as a Jesuit priest so his wildness was more of the mystical sort. In high school there were over a dozen of them but time took its toll. Tom Hoffman wrapped his GTO around a telephone pole before his twenty-first birthday. Rocco Scutelli hadnt made it back from Vietnam. Ronnie Mayer succumbed to lung cancer a few years back. ? ? ?My intention was that readers would care about a bunch of guys who had been there for one another for over thirty years both through the fun of hanging out together with beer and good food and through the tragedies of loss that are one of life’s constants. Did I succeed? Only a reader can tell me that.Writing a book that anyone would want to read is a lot like making love. For it to be good it has to be a pleasurable experience for both the writer and the reader. It is my belief that if a writer isn’t in love with his/her story, nobody else will be either. We seduce our readers with the passion of our words, we invite them in and say, Take off your shoes, get comfortable, and stay awhile. I want to tell you a story. I want to make you fall in love. ? ? ?online pokerThe Old Mermaid’s Tale?and?Each Angel Burns, available from Amazon in paper or Kindle), two collections of short stories, a cookbook/memoir of growing up Pennsylvania Dutch, and a book on knitting lace shawls. 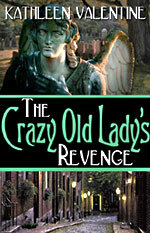 She recently published a psychological horror novelette,?The Crazy Old Lady In The Attic, for Kindle. Her web site is?KathleenValentine.com?and her blog is?Parlez-Moi Blog.